Having rich lobbies acting behind closed doors with politicians is nothing new. The whole system is run by money, as anyone who investigates what goes on in Washington could tell you, and those individuals and corporations who make big donations to politicians also get big friends. Now with last year’s Citizen United rule that was added to the books, opening the way for anyone to give unlimited amounts to presidential candidates, the money play is even more pervasive than before. Just this week, news media learned that Gingrich, one of the top Republican nominees, receives large amounts of cash from a single man, Sheldon Adelson. 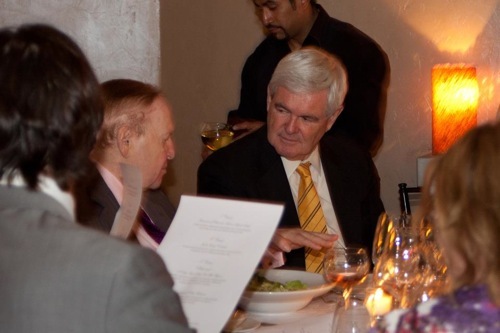 This multi-millionaire invests many millions into Gingrich’s campaign, and is making a powerful friend. But what exactly does that mean, and why could this be a problem? For one thing, anyone who becomes, by far, the biggest donor behind your campaign is sure to get the candidate’s attention. Indeed, the two men have regular meetings, discussing important subjects like Israel, campaign finances, and gambling legalization. You see, Sheldon has some very strong political views. For one thing, he made most of his fortune in Las Vegas, by owning casinos. So of course, he’s all for the legalization of gambling. But he’s also a hardliner, and believes in full US support of Israel. These views are shared by other Americans, but not all, and the problem is that if one man becomes so important to the next president, basically giving him the money he needs to reach the office, then that may give him and his views privileged access as well. Overall, this should not be much of a surprise. Many people warned that should such a law pass, and the doors stay open to large donors, then we would see cases like this, where a single entity funnels most of a politician’s budget, and the political agenda of the country could suddenly become very one sided. Palestinian elections move forward, but will this change anything?